Using the template as a guide cut out all of your felt pieces in preparation - you will need 7 top petals, 14 side petals, 14 bottom petals, 14 leaves, 7 middles and 7 round backing circles. 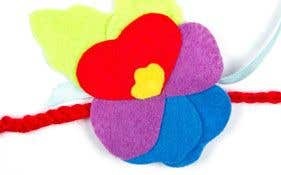 To make your pansies layer up your felt from the back of the flower to the top. Use a little blob of gem glue each time you add a new layer. First, lay the two leaves slightly overlapping each other. Next add two bottom petals on top, again slightly overlapping each other. Next add the side pieces, and then the top petal which will overlap the sides. Finally add the yellow middle. Allow to dry thoroughly under a heavy book. Once dry, turn the flower heads over and lay a length of ribbon about 15cm long across the back in with the middle of the ribbon in the centre. Fix with a spot of gem glue. Pop another blob on top and fix a felt circle on top. Again, allow to dry. 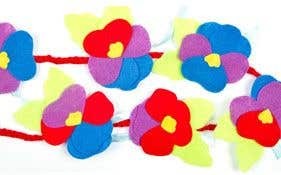 Use 6 strands of red wool to create a chunky wool plait to tie the pansies to. It should be at least 1 metre long. 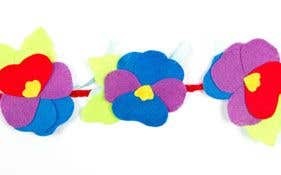 Once the pansies are dry, use the ribbon to tie them to the wool plait. Trim the ribbons ends and its done! Use sharp scissors to cut your felt for nice clean edges.